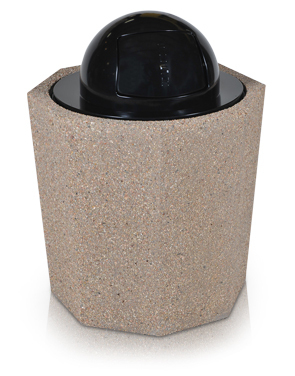 This heavy-duty concrete trash receptacle has an appealing octagon shape with a round opening for the liner and a dome top lid which protects from the rain or snow. The sheer weight of this receptacle ensures that it will not walk off your property. Treated with water-repellent sealer to enhance the appearance of the stones, help prevent water, salt or dirt penetration and cracking, and most importantly, extend the life of the aggregate by forming a protective barrier against the elements. Rigid plastic 36 gallon round liner measures 19-1/2" Dia. x 29-3/4"H and is sold separately. Drain Hole at the Bottom. 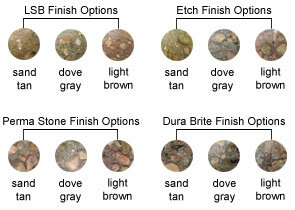 Dome top lid is secured with a hinge, and can be powder-coated with any of the colors shown in the lid color options. This octagon precast concrete trash receptacle is available in Light Sand Blast, Etch, Perma Stone, and Dura Brite finish options. Manufactured from high quality aggregates to ensure all requirements are met according to ASTM standards.